It’s not often a school district gains national attention by winning the Green Cleaning Award’s Best New Program prize, and then wins the Grand prize the year after. For Clarke County School District (CCSD) in Athens, Georgia, that leap was possible due to tireless dedication to protecting the health of students and staff, an impressive communications plan, cohesion across the entire school community and smart green cleaning choices. Well done, CCSD! “We say we are cleaning for health,” says Kimberly Thomas, executive director, plant services and custodial operations at CCSD. “But our other mission is to provide the best learning environment possible. 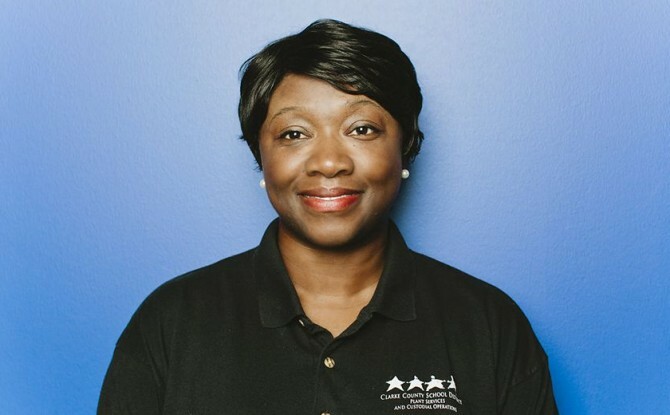 If we can make kids healthy and reduce their absenteeism, then the teachers can work with them to improve test scores.” Thomas is a member of our Green Cleaning Leadership Council and shows leadership not only in her school but in her field as a whole. Along with the district’s director of school nursing, Thomas’ team noticed a growing trend in the number of district students on allergy prevention plans. They made a promise to do whatever they could to eliminate asthma triggers in the school environment. Air fresheners and products with heavy volatile organic compounds (VOCs) were completely eliminated and all equipment now has hepa filters. Those changes led to bigger moves, like a switch to cleaning products that have third-party certifications and a pilot program for engineered water that will eventually eliminate the need for chemicals in most applications. Some of the big culprits that can eat into a school’s green cleaning efforts are products brought in from home by teachers and parents. CCSD is on a mission to eliminate all outside cleaning products from every classroom. This is a large undertaking, as these products often used to top school supply lists sent home at the beginning of the school year. For Thomas, education is key to changing the pattern. And when teachers push back, she shows them test scores in classrooms where outside products have been eliminated. They’re always the same—or better. Attendance is never impacted for the worse, only for the better. Thomas is making the link between green cleaning and improved attendance and test scores by collecting data. The school nurses in the 41 classroom buildings within the district share health and absence reports with the custodial department and administration that helps them track how well the green cleaning program is keeping kids healthier. The unifying message is that all parties are working to keep kids in school, improving test scores and achieving in academics. What’s unique about this approach is that it puts the custodial staff on the front lines of that mission, right along with the teachers and nurses. For those of us in the business of cleaning schools, this is common sense. But for the rest of the community, this might be the first time they are hearing that important message. “The staff felt like superstars when we won the Green Cleaning Award,” says Thomas. Students are also excited about the award. Some of the children made signs that say, “Our custodian is a national winner.” Thomas is really pleased to see those signs; it shows her that students acknowledge the vital role her staff plays in their day to day lives. “They’re getting that the custodian is there to make sure everything is healthy for them,” she says. The annual Green Cleaning Award, presented by American School & University magazine, Healthy Schools Campaign and the Green Cleaning Network, recognizes schools with innovative health-focused and environmentally minded cleaning programs. Winners are judged based on the 5 Steps to Green Cleaning in Schools. Is your school interested in being recognized for excellence in green cleaning? Be the first to find out when the 2016 award application is released!